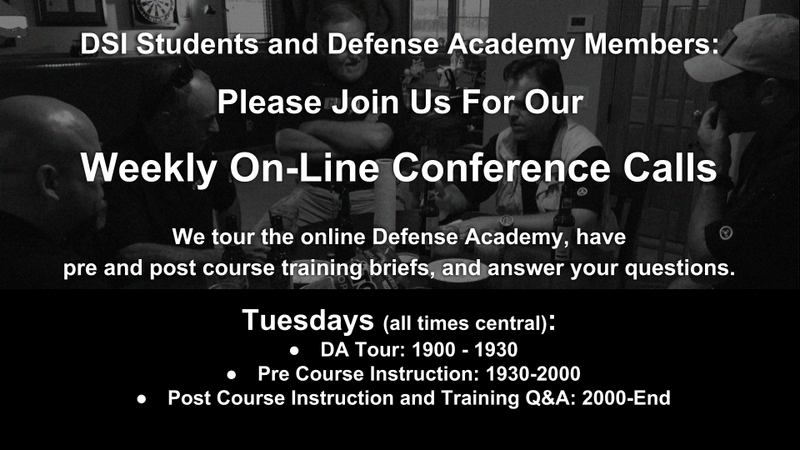 Do you have questions about how to use the DSI Defense Academy, or how to prepare for your course? Has it been a while since you visited the Defense Academy and things are looking out of place? Would you like to specific guidance on how to use the DSI Training Notebook so you can maximize your dry practice time in order to keep your skills sharp in preparation for your next course? If so, please join us for our Weekly Tuesday Evening Students Defense Academy Tour, Pre, and Post Training Q&A sessions. Simply click the provided link in the Student’s Portal (Login> Student Portal> Combative Handgun>Pre-Course, see bottom of Intro page). Buy a gun. Get trained. How Much Training Is Enough Training? Anybody who purchases a gun for self-defense at some point might find themselves actually having to shoot somebody. Theoretically, any basic firearms training should teach you how to use a weapon to defend yourself in a lethal confrontation. 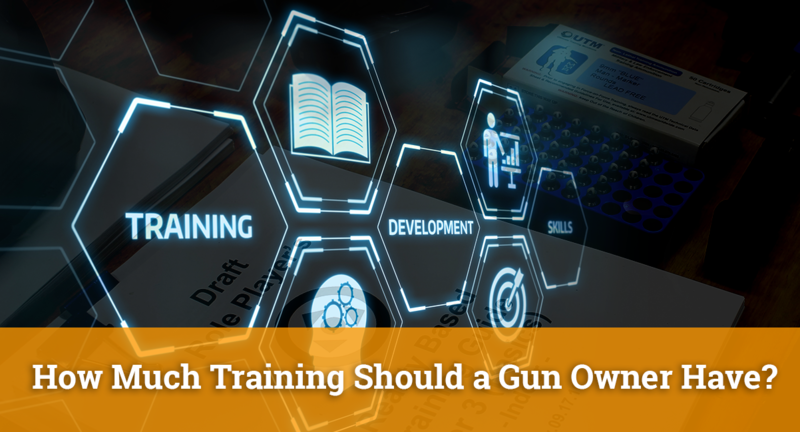 Since your life and the life of innocent bystanders are at stake – you should get competent training. Most first-time gun buyers spend less on their firearms training than they do for a month’s worth of yoga classes. After all, people spend thousands of dollars and hundreds of hours annually to pursue their hobbies and athletic pursuits. So you would think that a potentially deadly pursuit like purchasing a weapon for self-defense would cause them to prioritize their time and budget to learn how to safely and effectively use a weapon. Right? Most first-time gun buyers spend less on their firearms training than they do for a month’s worth of yoga classes. Or a new golf putter. And worse yet, once they have completed training they don’t practice what they learned (going to the range and shooting 100 rounds from a stall at a stationary target is not practicing). Understand that if you are engaged in a lethal force confrontation you will be in the fight of your life. Your body will react in ways that you never could have imagined. In a few short seconds you will be called upon to make life and death decisions while physically manipulating a lethal weapon. The ability to do this safely and effectively will be dependent upon the skills you learn and practice. 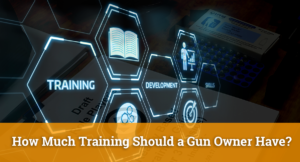 Yet most Americans think that a $75, four-hour concealed carry course taught by a local community college instructor using state-mandated PowerPoint slides that mostly focus on legalities and cleaning and storing their weapon is enough training. It isn’t. This is like buying a cheap pair of Nike trainers and expecting to run a sub three-hour marathon without actually training. Or watching a YouTube golf lesson and expecting to shoot par on your first round of golf. Just like any other human endeavor that requires you to learn a new skill, effectively utilizing this skill demands that you train. That you practice this skill. And nowhere is this more applicable than firearms training. When we started DSI back in 2009 it was with the intention of offering the training necessary to develop safe and effective defenders of life and property. 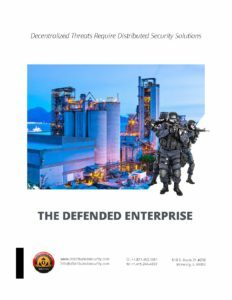 Over the ensuing 10 years we have developed a tactical training curriculum second to none and consisting of thousands of pages written over tens of thousands of hours by a team of military vets, security contractors, federal agents, state police, special forces operators, and SWAT team members. We deliver our curriculum via on-line, on-range, and on-site courses, programs, and hundreds of supporting resources. We use an integrated format that threads together pre-course, on-range, and post-course persistent training phases in order to develop safe and effective defenders. 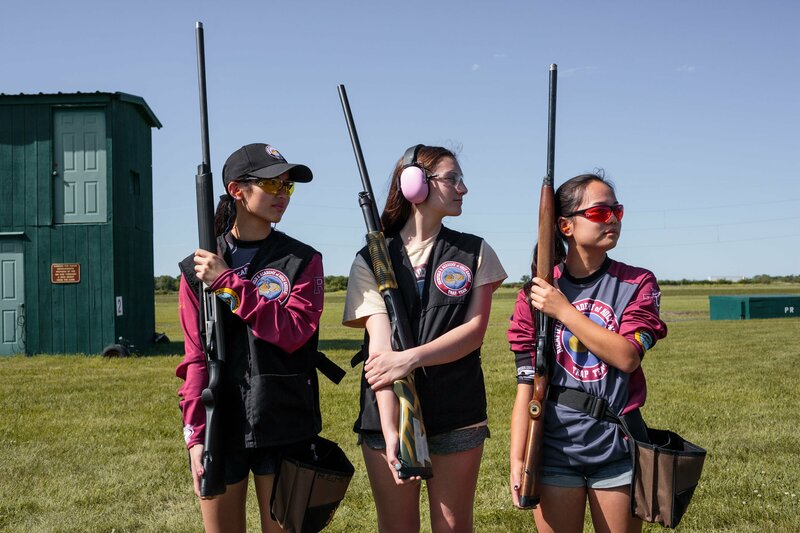 The most important phase is post-course, the persistent practicing of skills and techniques learned during the on-range phase. 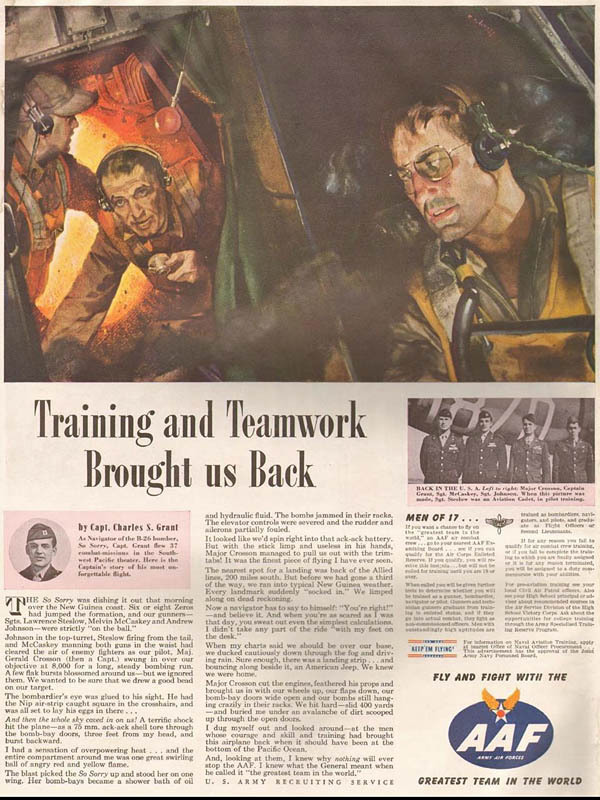 We cannot emphasize enough the need to practice, in a programmed manner, under the watch of an experienced instructor, the skills and techniques learned on-course. Nowhere does the old adage “use it or lose it” apply more than tactical training. For the CONCEALED CARRIER – 18 hours initial training + 74 hours persistent practice annually. For the casual concealed carrier who carries periodically in public venues like restaurants, shopping, commuting, etc. For an INDIVIDUAL DEFENDER – 48 hours initial training + 103 hours persistent practice annually. For the serious citizens who wants to learn how to safely and effectively defend life and property from lethal threats. For a TEAM DEFENDER – 72 hours initial range training + 133 hours of persistent practice annually. For serious citizens who want to learn how to work as a team to defend their business, church and school. The table below contains a more detailed breakout of training phases and the activities involved during each phase. These guidelines are developed with our curriculum in mind but can be adapted by other training groups or instructors. The Tier 3 – INDIVIDUAL TACTICS Program is designed for individuals who want to master armed self-defense in home and street scenarios. The on-range course reviews, refreshes and hones handgun skills taught in our modular Combative Handgun Program, and develops decision making and tactical skills with 12 escalating Reality Based Training (RBT) scenarios using non-lethal training firearms and live role players. Online training resources introduce a wide range of tactics, techniques, and concepts to streamline and accelerate the on-range training. WHAT IS RBT? RBT is a type of simulation or “force-on-force” training that provides stress inoculation – allowing the student to experience what violence looks and feels like during a lethal force confrontation. Because of the immersive nature of the training, the brain and body can absorb and process the experience as if it were actually occurring to nearly the same degree as if it were an actual situation. RBT boosts the student’s confidence in his ability to dominate adversaries under the normally debilitating stress of a lethal force encounter. This type of experiential training builds the fund of applicable experience that will speed effective decision making and effective performance in a crisis. STUDENTS LEARN how distance and reaction time force decision making in a lethal force confrontation. They learn how to test for compliance and de-escalate a situation by clear, forceful verbal commands. They learn how to quickly assess and react to a wide variety of threats, and apply their decision making, gun handling, and tactical skills in realistic scenarios, under conditions that include low light, multiple adversaries, stress, limited time, and uncertainty. They learn how to communicate effectively with 9-1-1 operators and responding law enforcement officers. 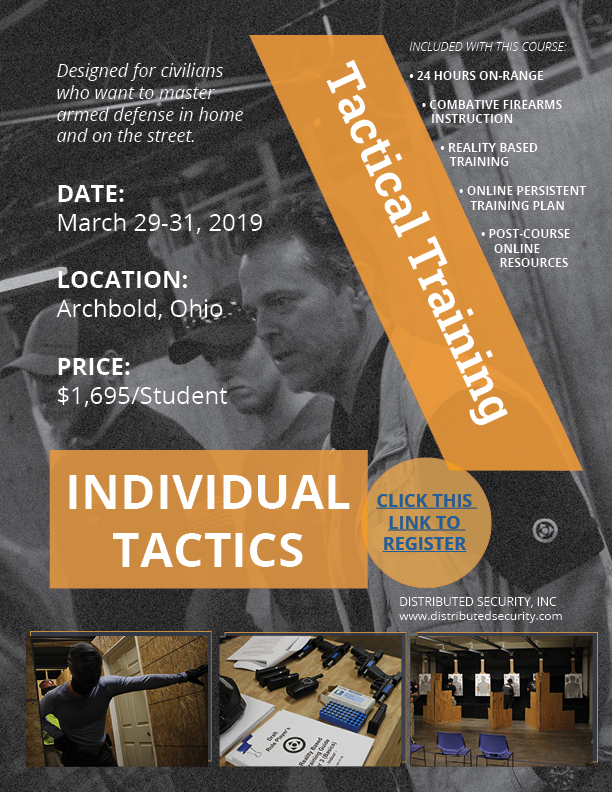 This course is suited for graduates of our Combative Handgun Program (or, with our review and approval, similar quality training obtained elsewhere), who want to hone and refresh their gun handling skills while applying them in the challenging RBT environment. We include basic tactics and techniques for two people working together, making this Program especially well-suited for couples who want to learn how to defend their home, working both individually and as a team. Our training methodology is delivered in three phases: pre-course information and guidance, range training, and our post-course support system. 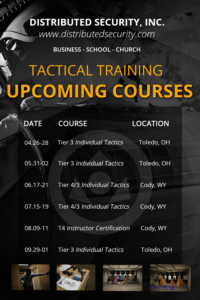 Pre-course: When you register for this Program, you will receive detailed instructions and access to curricula, instructional videos and photos, drills, manuals, scenarios, and other resources in our online Defense Academy so that you can, on your own schedule, become comfortable with key concepts and techniques before you attend your on-range Tier 3 course. 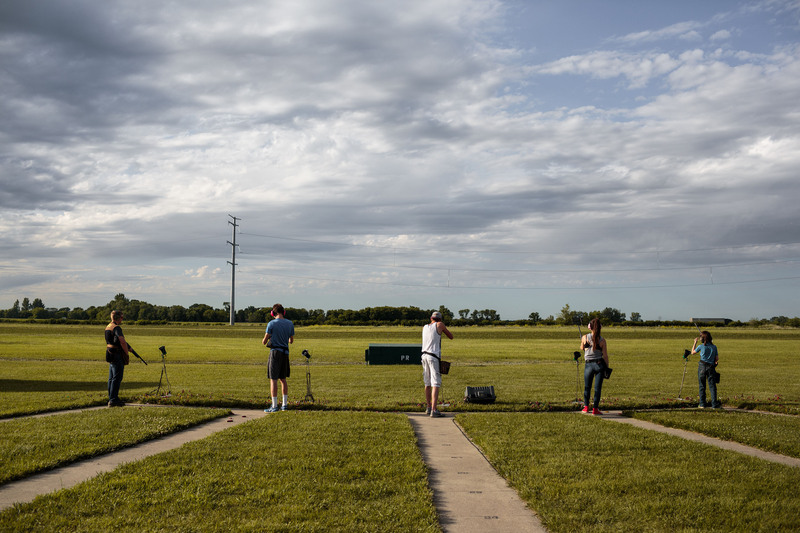 You will have access to qualified instructors who can answer your questions and address your concerns before you ever set foot on the range. Your completion of the pre-course work allows us to minimize “classroom” or lecture time during the range training event. While awaiting your turn to rotate through each RBT scenario, you will practice and polish your gun handling skills with our expert instructors on the live fire range. In RBT, you will apply those gun handling skills along with effective tactics and solid decision making to solve realistic, stressful, and increasingly difficult problems that pit you against well-trained and carefully scripted role players in a safe training environment. Post-course: You will gain access to additional resources in the Defense Academy to help you review and sustain the skills and knowledge you have developed in your Tier 3 course. Our training staff will remain accessible to answer any questions and recommend further training opportunities. PREREQUISITE: Completion of DSI’s Combative Handgun Program. Comparable training obtained elsewhere may be an acceptable substitute, at the discretion of DSI’s Chief Instructor. I weep for Germany and its unarmed citizens. However, there is a bright side, the market (even if it’s black) is working just fine. It seems that some enterprising individuals were able to start an online business, find the demand, ship products, and shut down their operations quite successfully. With the advent of the distributed internet (Maidsafe) cryptocurrency (Bitcoin, Safecoin, etc.,) 3-D printing (plastics, metals, and ceramics), and online marketplaces such as OpenBazaar, I suspect you will see many more people opting for personal security. Various packages were available to customers, ranging from €7.99 to €799, and includes guns, grenades and ammunition.Professionals, including doctors, were getting the deadly weapons delivered to their workplaces, according to Sued Deutsche. As we mentioned in the Tactical Definitions post previously, cover is something that will provide ballistic protection (like the engine block of your vehicle) and concealment is something that won’t provide ballistic protection (like the dark, shrubs, furniture, etc,). While using cover and concealment sounds simple enough, there are some nuances of which you should be aware, which if not understood and properly respected can come back to hurt or kill you. The working area simply refers to the area you can work behind cover without exposing yourself to your adversaries direct fire and varies from situation to situation. As Boyd so adroitly pointed out, we need more interaction and influence with our environment in order to thrive. The more influence you can have on a given area, the greater you are able to shape the situation to better meet your desired ends. We call the space you have direct observation over, and which you can potentially interact with and influence, the sphere of influence or “SOI,” because it represents a 360-degree sphere or “bubble” around you. In the following diagrams, you will get a better idea of how the sphere of influence can be visualized. In the below photos you will see two targets. Both targets were shot under identical conditions, with one exception; the target on the left was “hugging” cover (well within arms reach of the cover), and the one on the right is the one that was about 6 feet or one large step back from cover. We have used white arrows to help you see the effects. The larger the arrow, the larger the impact from the spalling. In the previous post, we talked about additional considerations for moving safely. Let’s take a closer look at the concepts that surround this subject. a. Distance – can be the distance your adversary is from you, the distance you are from your cover, and/or the distance you need to move to get to where you want to be, etc., all of which can play to your advantage if you know how to use distance. The FBI/DOJ, tell us that the vast majority of lost defensive gunfights will take place in very close proximity to you (7-yards and in), and your adversary will dictate this distance, especially if you are caught unawares. Now that you have a basic individual movement technique down, let’s go ahead and start thinking about how we can safely use our environment so we can get to where we want to be as safely as possible. As we have mentioned before, clearing an area means that we are searching an area in order to either safely bypass the area or to occupy it. In order to get to where we want to go safely, we want to move tactically. Again, this is using a broad brush stroke to simply say that your movement should fit our situation so you can arrive at your destination safely and effect the desired change. There are many ways defensive scenarios may play out. Two of the more common are the ambush contact where your adversary has maximized his surprise in his attack, and he springs his attack close to you in order to maximize the psychological shock. In the last post we covered what Individual Movement Techniques were and their purpose, in this post we will discuss the first ITM, the heel to toe method. To start moving forward, all you need to do is begin in your generic shooting stance (see the 4th drill in your firearms drills manuals) which is; feet comfortably apart, with the feet, hips, and shoulders roughly on the same plane, add a light natural bend in the knees to lower your center of gravity (which will act as your shock absorbers during movement and is a position you will most likely find yourself in when under stress), and top it all off with the weight of your body over the balls (just behind your toes) of your feet. Think of this as the “ready to move/pounce in any direction” stance, because if you are positioned correctly you should be able to quickly move in any direction instantly without having to redistribute/ transfer your weight first. Keeping in mind the tactical principles we spoke of above, we are now going to incorporate individual movement techniques. What are individual movement techniques? Individual movement techniques (IMT’s) are the most basic footwork techniques that are employed at the individual, team, and higher level. If practiced appropriately, these basic tactics and techniques should serve you well when you do have a second shooter (such as a significant other or a friend) to back you up. The purpose of footwork is to get you from where you are to where you want to be safely and as quickly as you deem necessary.As you can well imagine, in most gunfights you will need to maneuver in order to put yourself in situations that you can begin to shape circumstances. In the last post, we talked about how to set up and conduct the memory enhancing KIM (Keep In Memory) game. 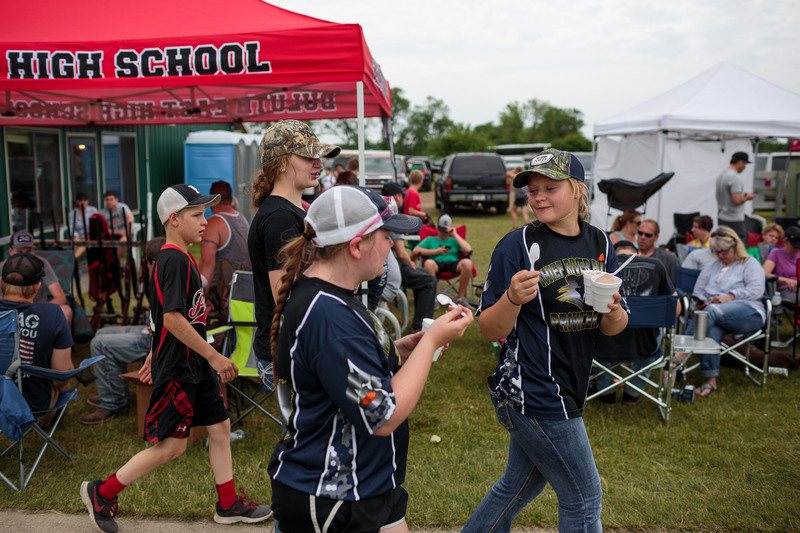 In this post, we will give you some ideas on how to add variety, help increase mental flexibility, improve retention, provide more opportunities to grow their skills. – Add one item for each new game (up to 20). – Increase the time between the game and the time the trainees are allowed to write. For instance, during the second exercise give them a 5-10 minute task or a break before they are expected back in the classroom. The next time it may be 15-30 minutes of some other task/break/combination and eventually, it can be days or weeks between the observation and the writing down of the items in the KIM Game. Originally adapted from the Rudyard Kipling’s book Kim’s Game, the object of this exercise is to help increase a student’s memory. KIM games are used extensively in the military for a reason, they work. KIM games easy to set up and run by micro-teams (2-3 men). For your observation exercise, you will need some help (your battle buddy), some basic tools and class material, and some training aids. Everyone should take turns setting up the KIM game and partaking in the exercise. KIM games are normally set up with both items from the real world such as tactical equipment, projectiles, brass, pens, scraps of paper with writing or photos on them, cleaning rods, boots, etc., and realistic miniaturized toys such as rifles, handguns, vehicles, people, tactical equipment, etc. While I understand why people make up lists for the “x” best “armaments or equipment,” it is important to always remember that the single best thing you can get is training. 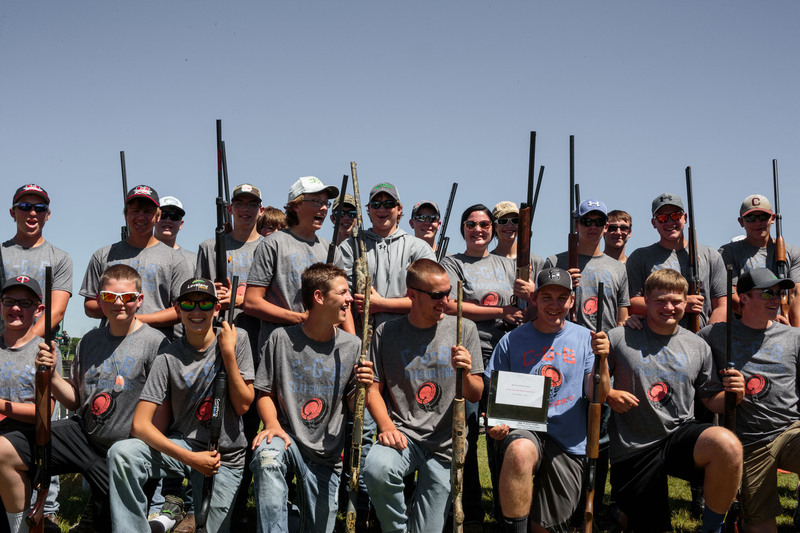 “The best gun to win a gunfight with is the one in your hands” is what Evan Marshall says. The reality is that you can fight like a champ with what you have as long as you have the training required to use it well. Give an operator a Hi-Point or the darling of this week’s gun magazine and the problem will be solved just as quickly. They may curse you for the former and bless you for the latter, but make no mistake, it’s not the gun or equipment doing the work, it’s the training they received and the dedication they put into mastering any new tool or equipment they are issued. Having said that, please, do go out and experiment with different firearms and equipment to your heart’s content. Please do support the industry with your time and money, it will spur further innovations we all can all use.f you are lucky, you will find a tool or equipment that is worthy of joining or replacing something in your carry kit. If you are lucky, you will find a tool or equipment that is worthy of joining or replacing something in your carry kit. But while you do, just remember that it’s your training that will put you over the top and make you better, it’s not the tools and accessories themselves. Rep. Carolyn Halstead, a Republican, said her backpack caught on the gun as she took it off. She said she quickly grabbed the gun and put it into her bag… Witnesses said several children were seated nearby but the hearing carried on with little disturbance. At the bottom, they tie this article in with the fact that the state of Illinois – which is filled with great people, yet is dominated by that shining beacon of purity, prosperity, and peace, otherwise known as “Chicago” – has restrictive gun laws for the places the state conducts its business. The article seems to be suggesting that the logical solution is to have the same enlightened laws (such as those that have been impressed upon the people in Illinois) foisted upon the people of New Hampture. While you continue to sharpen your senses and observation skills with your 4-senses drill, begin playing situational awareness game that Jeff Cooper called the “Xs and Os game”. To play the Xs and Os game, keep a running list of all the times someone surprises you or catches you unaware in your daily life, whether at home, driving, the office, at the gym, or walking, hiking, jogging, or running. Your goal in the Xs and Os game is to eliminate all Xs. Use your 4-senses drill throughout your day, at work, on the road, in conjunction with the Xs and Os game and you will be well on your way to becoming situationally aware.